Before there was the disaster named Ashk, there was the mega hit Humsafar, and before that game-changer there was the two very different serials: the exquisitely beautiful Kalmoohi, and the compelling Aao Kahani Buntay Hain. This is about the time I started following Sarmad Khoosat’s work seriously and became a fan. Along with a handful of others, Mehreen Jabbar’s Kahaniyaan being one of them, these are two of my favorite go-to serials. I watch them whenever I get really angry and frustrated with all the nonsense being dished out daily in the name of entertainment. Today was one of those days … After torturing myself with the final episode of Ashk, I just had to watch something else in order to console myself … something that could help restore my faith in Sarmad the storyteller … something to remind me why I had become a fan in the first place… And, so what better to watch than the very honestly told stories of Aao Kahani Buntay Hain. 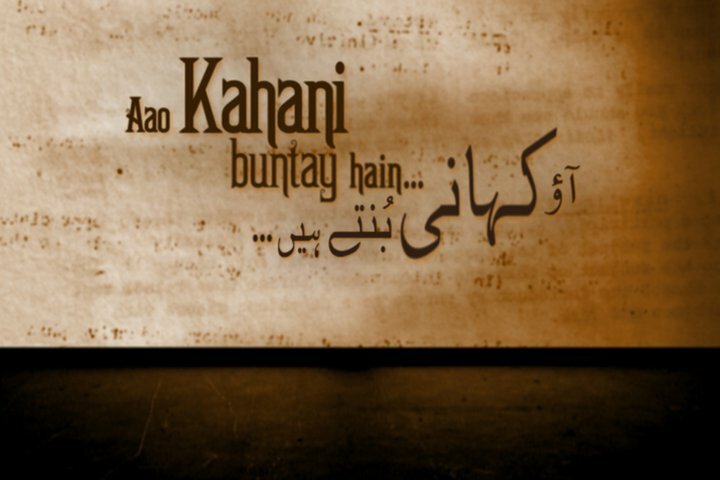 Aao Kahani Buntay Hain is a tele-series, comprising of thirteen beautiful stories that are narrated, or rather “knitted”, by a writer, Nauman Ejaz. His wife, Sania Saeed, helps in the creative process, thinking through the various characters’ mindsets, at times offering her own unique perspective on their development and the overall story. Each of the episodes revolves around one such story created by this talented couple. What is interesting here is that even though these characters are created, and they live through scripted situations, they still maintain some agency. Hence the ending is at times unexpected, the writers as surprised and moved by the outcome as the viewers. Ostensibly more about the created characters, Aao Kahani Buntay Hain is nonetheless also a story of the talented storytellers. Though never explicit, the couple shares a very strong bond. In some ways, through the camaraderie they share in the process, their marriage is being continually strengthened through this act of telling stories. Both perhaps sublimating their latent anxieties and insecurities into these fictional characters’ actions, while simultaneously looking for solutions in the impossible situations in which they place their characters. What I absolutely love about this tele-serial is the simplicity with which the stories are told. There is no resort to gimmicks here, no bells or whistles. No exotic locales, no fabulous sets, no camera angles, no fancy lighting, no haunting OSTS, nothing … this is just raw story-telling at its best. All you have here is a fantastic concept, two magnificent actors, compelling stories, and a great director. The sets are innovative, reminiscent of theater sets, relying more on creativity of the designers and the intelligence of the viewers. Director Kanwal Khoosat deserves a huge round of applause for maintaining a very able grip on the various stories being told here. On the one hand this is the story of the created characters, but then on the other hand this is also a story of the story tellers themselves. Unbeknownst to them, much like their characters they too are being watched; we the viewers are looking in on them, like voyeurs through peepholes. Indeed, all the world’s a stage and all the men and women merely players… the Bard always did get it right! Above and beyond all else, Aao Kahani Buntay Hain is a fantastic homage to the brilliant Sania Saeed and the equally superb Nauman Ejaz. This is what being an actor is all about; stripped of all props except their talent, it is a sheer pleasure to see Sania and Nauman breathe life in to all the various characters they create in their capacity as the writer couple. I realize that these kinds of abstract stories are not an easy sell, but even if they don’t appeal to you, or you’re not a fan of the offbeat, more artsy dramas, you should watch at least an episode or two just for these two actors. After watching something as avant-garde as Aao Kahani Buntay Hain, I always end up feeling sad that our channel heads and producers are so caught up in the race for TRPs that they seem to have lost their souls somewhere along the line. Even though there are about 1001 dramas currently airing, with the exception of Coke Kahani, and to some extent Aik Nayee Cinderella and Tanhaiyan, the rest all revolve around the same three – four formulaic plots. Why is it so hard for a channel to give us at least one hatke drama a week. Surely that’s not asking for too much?! OK lady , You chose the right song for sure. The problem with me is I keep hoping. If I had not hoped I would not be this disappointed.You can tell I am writing about ASHK , right?Ok on to bigger and better things I hope. sorry but now I am even pessimistic for ZGH, I hope Fawad is done with these kind of “bad husband” roles and chooses something different for his next project. As for FK, I think he should take a complete break from playing the traditional hero and play the villian somewhere or take on the challenge of playing a character role rather than these chocolate hero type ones ..
Didn’t he try to do that with Kpkp and AA, but not many dramas are made with those types of characters so he probably has few choices. As for this drama you’ ve reviewed, I had never even heard of it, looks very different so may give it a shot when I have time IA. I think it originally aired on PTV in 2011 and is in re-runs now. The director, Kanwal Khoosat, was nominated for the LUX awards this year. I remember Sarmad telling me that he had taken this serial to all channels but had a hard time selling this, b/c everybody was afraid of taking on something that was critically interesting but commercially non viable …..
Apni sunao .. how’ve you been? Hilarious song choice SZ perfectly suited! oho ashk ended,salute to your patience for managing to sit by the whole mess.If nothing else Ashk certainly has made you us all lot patient seeing humor in the most irritating,tragic situation. I was watching Akbari Asghari the other day and I thought wow,look how different Fawad looks here. He still looked cute:) but the chalak ,almost villainous Asgher was very well done.Anyway Now I am looking to watch kahi unkahi regularly. BTW have you got Hum still ? I hear they are renegotiating with Dish network. @ the post: i have never watched Aao Kahani Buntay Hain either but sounds interesting and thankfully its on youtube. Now i know what to watch when nothing else is good or worth a watch. Btw how come no channel was interested in this play?? Oh and what a perfect song to go with Ashk – haha they should have used this as an OST. sab ke armaan including the cast ke beh gaye .. Praise the Lord the torture has come to an end! Did we really need to see Ajjos labor scenes and all the crap that came with it??? How hard is it to pop that fake baby and keep it moving to more FK screen time!! oh well done complaining, just glad its finally over! Rest in peace and never come up again! There is only USA streaming. how do you get pakistani streaming? Lol!!! Can’t stop laughing at the song choice. I don’t know how you connect things so well like that… the part you quoted fits especially well! Watched yesterday’s episode just to see what happens in the end even though I’d stopped watching ashk since a while. All it did was remind me why I’d stopped. I can’t get over how people like fawad khan and sarmad khoosat could go so wrong? What happened!? Everyone makes mistakes I guess? Really, the song choice is so funny! Sarmad Sultan Khoosat is a script-writer, director and actor who became popular in the 1990s with the creation of his PTV show, Shashlick. But it was Humsafar that took his success to greater heights. The show was an overnight success and Sarmad’s direction had a huge part to play in it. 7:55 Comment From Rahim. The drama explores clichéd mills and boons themes, how it worked for mass audiences and did you expect it to? 7:56 Sarmad Khoosat. I agree that it is very mills and boons but probably that’s what the audiences wanted, (some good melodrama and I didn’t expect this massive a response at all. 7:57 Comment From Aleesa. Why did you feel the need to re-shoot the last episode? 7:58 Sarmad Khoosat. Just the last scene, we needed more romance and RAIN. 7:58 Comment From fazeelat. Why are mother-in-laws always made out to be such tyrants? 8:00 Sarmad Khoosat. I’ll blame that on the novelist/screenwriter…..and that comes with the genre…..melodrama banks on cliches and very little grey areas. 8:01 Comment From Tooba Akhtar. Dramas like Tanhaaiyan, Dhoop Kinare, Unkahi, the Urdu drama era classics, were all super hits primarily because of the quality of scripts and acting. In this day and age, do you think that the measuring scale for quality TV dramas has changed now that so many other aspects play a role in promoting a drama’s popularity? 8:06 Sarmad Khoosat. I believe the script is always the winner and performances are based on the ‘book’ even if they diverge a bit or are re-interpreted. Humsafar does belong in the same sensibility as it is not too high on the production values as such in technical terms. Direction wise it uses a lot of close ups which keeps every other element of the frame (screen) in the background, the emphasis being on the actors and dialogues or the expressions. When it comes to promotion, Humsafar was very under-promoted other than promos or trailers on TV. We went on air with zero or bare minimum print promotion. 8:06 Comment From SZ. What were some of your thoughts as you converted a desi urdu novel to appeal to a wider cosmopolitan sensibility? 8:08 Sarmad Khoosat. I swear I never thought about that. I never thought I would make it appealing to the urbans or desis in particular…..but I think that has to do more with the kind of cast. All ‘ungraizee medium’ (brilliant) actors. 8:08 Comment From kohari B. I heard part of the serial was filmed in Mirpur Khas – is this true? I’m from Mirpur Khas and I’ve never seen a house like that there! 8:09 Sarmad Khoosat. Yes that’s true. It’s inside a sugar mill…..like a farm / summer house That’s how the production was designed. 8:09 Comment From arisha g. If you had the liberty to make a drastic change to any aspect of the novel’s interpretation, what would you have taken out or shown differently? 8:12 Comment From SZ. Does the success of Humsafar mean that we’ve lost you to the biwi/shohar type stories? No more Kalmoohi type dramas from you? 8:16 Comment From Guest. A more general question about our dramas on air these days, in order to show a woman being strong (the latest trend) why does the man have to be so weak (Ashar cried buckets!) why can we not have both protagonists on equal footing? 8:19 Sarmad Khoosat. I completely agree with that. I think our writers need to write stronger male characters, some nice male-centric stories too. I guess since we have a lot of women writers nowadays hence they focus more on the female characters (forgive my sexist statement please) but that’s true for most of the scripts I’ve come across lately. 8:19 Comment From Hamza Qaiser. I appreciate the quality our TV dramas have achieved over the years but don’t you think we are stuck with one kind of genre and have stopped evolving? Have you considered making good comedies or sci-fi thrillers for primetime in Pakistan? 8:24 Sarmad Khoosat. I guess TV has just regained a larger audience and as we explore more audience, which is not just the housewives as per common consensus, more genres would be explored, I directed a murder mystery (produced by Mehreen Jabbar) in 2008 but it never clicked. But I guess now we can experiment a bit and if we develop an audience for other genres, you’ll see more variety, maybe not in the primetime slot though. The channels need to take some risks with ratings for that so they need to be braver! 8:24 Comment From SRA CA. People from around the globe were attracted to Humsafar. Even The Toronto Star did a report on this drama. Besides the direction, acting, and script to what extent did social media play a role in the success of this production? 8:26 Comment From SZ. When can we expect to see your name on the silver screen — you’re so ready! Particularly after the heavy duty melodrama and Atiqa channeling Bahar Begum (as over the top mother-in-law) from the 70′s Urdu films, Khirad being kicked out, and removing the pin-from-the-bun scenes!! 8:30 Comment From Sumera. My question/comment is on the suicide act that Sarah commits. Although it is dramatic but I think this should not have been done this way. It shows and gives a message to all those females who don’t get to marry their loved one that the only option they have is to commit suicide. I think there is a very negative message here for females. There are a lot of alternatives and a lot of options available that could have been show rather than the sad demise of Sarah. Really, suicide should not be encouraged or shown as an option even. 8:35 Sarmad Khoosat. You are absolutely right, but stories are stories. I don’t think that we were preaching it really. People are supposed to learn a lesson instead. I also agree that there could have been other kinds of resolutions or conclusions to her character but that’s what the writer wrote and we sort of stuck to the ‘book’, so it’s just a ‘drama’ and I categorically made note of the suicide scene on every show. It isn’t meant to inspire anyone and I made sure it was shot in all the negative light possible, I tried! 8:35 Comment From Hina. What are your upcoming projects? And when will I be able to see Mahira on TV again. I miss her. 8:37 Sarmad Khoosat. I have just finished filming this serial titled ‘Ashk’ and that would come out soon around end April inshaAllah. It has Fawad in it and there is a project in the pipe line with Mahira too. Other than that I am also going to do a period play soon. 8:37 Comment From Shawn, CA. I haven’t read the novel and was wondering if in the adapted version, Farida’s motive were kept hidden from the audience. Until the incident at Khizr’s apartment, the audience was kept in the dark about Farida’s evil plans. I felt a bit manipulated. 8:39 Sarmad Khoosat. The novelist was herself the screenwriter by the way so any changes to the actual plot/content were her own and frankly when I was told that it’s based on a novel then I made sure that I don’t read the novel because that just creates differences of interpretation and I was safe because Farhat had herself adapted it. 8:39 Comment From SZ. A huge problem these days is the way stereotypes are being easily re-inforced – how conscious are you about your role here? 8:43 Sarmad Khoosat. I’ll be honest, I have tried more gritty and realistic and not very stereotypical kind of scripts too. Simultaneous to Humsafar’s telecast term I had another serial titled ‘Jalpari’ being telecast on Geo. It didn’t do as well, not that I’m comparing content essentially but prime time is focused more on what sells with the audience. I do want to integrate agendas and causes but for that I guess I’ll just have to wait until I find the time to be involved in the script writing process from a much earlier phase. 8:44 Comment From Hamza Qaiser. Just wondering, who’s idea was to pair up Mahira with Fawad? I believe they are both very marketable faces, especially when put together. 8:44 Sarmad Khoosat. Momina Duraid’s! 8:44 Comment From Adil. While the serial was in middle and got very popular, did you guys made any changes to sustain that popularity or thinking or worried that it would remain popular? 8:49 Comment From SZ. Given the TRP system, and the way producers follow them, don’t you think a large cross-section of the audience (the thinking audience – sorry to be so un-pc here, but yes, demographics other than housewives also watch Pakistani TV) is being left behind? 8:54 Sarmad Khoosat. Absolutely yes, but that’s the inherent flaw / dilemma with things that target mass consumption. They need to diversify of course, this is my first commercial success my intro to theTRPsystem. I have told all sorts of odd stories but they target the unfortunate (not catered to widely) niche only. I did a series titled ‘Aao Kahaani Buntay Hain’ which was directed by my sister, Kanwal Khoosat, and honestly I had such difficulties selling it to any channel and everyone, hands up, rejected it after saying it’s great, creative and all those nice things but ‘very difficult or impossible’ to market you shall check it out on youtube please. 8:54 Comment From Shawn, CA. How long did it take to shoot the confrontation scene of Ashar with his mother in last episode. I have seen that confrontation scene like million times on YouTube and can’t get over how superbly Ashar has delivered his dialogues. 9:01 Comment From zka. Was your reaction to the “whole finished package” any different from when you started? Did you think it would appeal to both the females and males, and that too of all ages? 9:06 Sarmad Khoosat. I am very happy and pleasantly surprised. Humsafar was quite a journey that way. A lot of things were completely unexpected. It stayed very organic till the post-production phase. It kind of kept growing on its own, the romantic scenes in particular turned out to be much nicer and better in the finished package:) and I guess its biggest achievement is getting the male audience and the ‘Yo’ kids back to desi television. I still wonder how though! 9:07 Comment From Erum. From a self-confessed Humsafarite as not a day has gone by since the day the drama has ended that I have not seen favorite scenes over and over again or found new depth in ones I’d missed before and its that dynamic interaction between the layers you find in the story and some insight into yourself that all good drama induces us to do so a very grateful thank you for putting together something so fundamentally profound. 9:10 Sarmad Khoosat. I am thoroughly overwhelmed, humbled and obliged by this massive and kind appreciation. I guess Humsafar now is more about the fans of Humsafar rather than the makers of it, jaaiye aap kay havalay kiya much love and gratitude. Nice!! Thanks for posting…very interesting questions and answers! SZ i read them i while ago they were really interesting i remember infact Momina’s chat was really interesting too.She got some hard questions. SZ, That’s quite a conversation with Sarmad! thanks for posting it. I’d heard about ‘AKBH’ at the LSAs, it won a few na? the ones in the terrestrial category. And yes, you couldn’t stay away from Ashk na? Na chahtay hue bhi- you sort of reviewed it in a round-about way 😉 Lucky Ashk! Sarmad had been hinting at a movie in this and other interviews , What if Bollywood offered them a Humsafer Movie but Deepika had to be the heroine ? I can just imagine it, Khirad in shorts, riding on the back of a motorbike; oh yes and her hobbies would be hand gliding and collecting slinky shoes.Asher of course would be her fourth “relationship” because you could not possibly expect a girl to wait around for boring graduates from Yale ….. But I do wish Sarmad comes back from A&B land soon. It seemed like he’s playing Manto in an upcoming period play that he mentioned in his chat. BTW thanks for posting the chat transcript. Very Very FUN to read! Great responses from Sarmad! the guy can think on his feet! @Annie: wow! agreed!! the whole road trip idea to do this drama in various theaters of Pakistan would be so cool but since its not so common in Pakistan i don’t know the response would be. haha so funny about Salma Agha, she is so freaky looking! she needs to chill out with all that Mac. Salma Agha is alive and kicking , she and her daughter were at Yash Chopra’s funeral . Turkey wali eid mubarak to my US friends! does pakistan celebrate shukrana-giving day?? No Ash we don’t 🙂 Yahan, aik din sahee guzr jaye toh shukr karte hain. LOL Thx Afia…yes,time for some turkey!! Tomorrow and Saturday more davats and then it’s back to work on Monday! @ Annie, Ash and SK: Sounds like you guys had a fab Thanksgiving 🙂 Annie, you should ask the lady for her recipe and share – I’ve always had very boring turkey, and would love to try one with some flavor to it! @Annie: I also had a pretty yummy Turkey as well! =) I think my mom adds a desi touch to it so it tastes a lot better and not dry at all. I’ve been eating since Thursday and lots more eating to go ke by the time this weekend ends, I am sure i’ll gain about ten pounds! =\. I know what you mean we had turkey day plus 2 full days of desi Khana with out of town guests – just got done with the leftovers. Now I need to eat light for the next few days !! So thanks to your review on Aao Kahani Buntay Hain, i ended up watching an episode this evening, called burf [ice]. I loved the settings and the whole theatrical look they gave to it. It was really different and only two characters supporting the episode. Very straight forward story and to the point! The ending totally got me by surprise though, was not expecting that, but it was good to see something hat ke from the norms. I am def planning on watching the rest of the episodes at my leisure. The only annoying this is a 40 minute episode has 5 parts that are all mumble jumbled, khair, i guess i’ll make a playlist out of it because jumbled videos annoy me. Ashk remained as Ashk-y as it was in the previous episodes, not to forget the admiration (plus attention) Ajjo and Deenga got for their fazool Betein and personalities. None of them was ever fun to watch. (considering how Chandni from TNS makes an episode colourful) We saw nothing like that here. Neelum didn’t do well in the last scenes. She was flat and showed no feelings what-so-ever witnessing the change in Rohail. Ajeeb hi tha…Kash Ashk sey Phelly ZGH aata so that Fawad’s drama choices’ graph would not have declined. by the way thank you so much for sharing Sarmad Khoosat’s interview with us, I thoroughly enjoyed his responses to your questions. p.S the conversation following this write-up is keeping me entertained. @Heela: What a great comparison you draw between the characterization of Chandni, or for that matter even Bibi, and the miserable Ajjo/Dinga pair – you’re so spot on! GReat to read SArmad’s interview….Did Momina Duraid or someone else from the HS team gave too? Can SZ or someone else post it or give me the link? I want the best actor of pakistan. I watched Tees Minute today. I really enjoyed the very theatrical set up and story telling. It’s been ages since I went to watch a play in a theatre but this story managed to recreate that same feeling. You mention the aspect of “watchers being watched”, yes I got the same feeling as well. Also the set – the claustrophobic atmosphere, the caged birds, the faded, jaded decor and clothes in Dina’s home (as opposed to the colourful home of the Miyan-Biwi), props to the team! In fact, the complete contrast of the two sets of characters – the easy camaraderie versus the bored one-liners, the young versus the old, the colours versus the grey, it was very nicely done. Sorry, my phone lost all the charge as I was typing! I like these kinds of stories where they make you think, ask subtle questions in a non-judgemental way. Thanks for shedding light on these stories SZ. I just finished watching “Sunset” (and I picked it because it showed up first on the YT playlist, lol). What an absolutely fabulous and unique concept. My primary interest in television (in any language) is storytelling and I love that this is actually a story about telling a story. I love how the scenes are filmed so theatrically, like a stage play on film. Also, Sania Saeed was absolutely perfect as the bored and embittered “call girl” jumping from one boyfriend to the next because she doesn’t believe in love. Also, Sarmad as lovelorn boyfriend #7 was an unexpected surprise. And then the unhinged Mujeeb enters the story and everything goes in a very different direction. NI and SS are awesome in the Miyan-Biwi roles too, and their arguments about how to tell the story. I especially liked their argument about showing vs telling and Miyan’s insistence that women are just impulsive. Oh, that would be awesome. Btw, I think this show also has a wonderful title sequence with the kathak bol and the silhouette dancers. Sure SZ, take your time please! Let me watch a few more, we can discuss aaraam se next week. Have a good trip and a nice weekend. Lately I am watching Gulzar serials . Very short stories for half hour .but they are so real and always a message there .have you watched them ? If you have time can you throw some light . SZ you always have nice way to elaborate . ( om pari and Nina Gupta).hope you donot mind me asking you . @Ranjan: Hello 🙂 No worries about asking I’m just not sure if I can review these plays ..I have so many unfinished posts that need to be completed that I can’t promise, but will keep these in mind. Thanks for the heads up. I watched another installment of this show over the weekend. This one was called “Nirtaki” and, as the title suggests, the story involves a dancer played by Sania Saeed. The story itself isn’t particularly exceptional, but SS does a fabulous job capturing the character’s innocence and positive spirit. She’s really a treat to watch and especially in her scenes with Sarmad Khoosat. What stood out for me in this episode where the Miya and Biwi characters as they spun out the story. At one point, Biwi asks Miya why the mother character in these stories is always bechari and bebas, and he tells her “well, that’s the default setting.” It was both ironic and exactly on point. Oh, speaking of irony: Uzma Hassan plays SS’s mother in this episode. So many dramas have started recently - which ones are you watching? What story’s caught your interest? Which actor you think is doing justice to their character? Which one has the best story? Konsa dekhna shuru kurun? Hit me up with your suggestions! Let’s go!